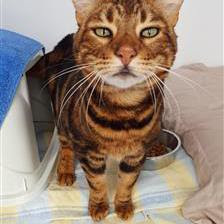 Another handsome boy looking for a forever home is Felix! Grooming is one of his favourite past times. He also likes a warm window seat to watch birdie TV. 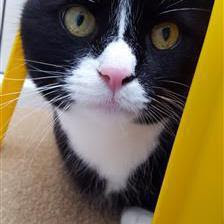 Can you offer Felix the quiet home he needs? Check out his profile on the Wood Green website. 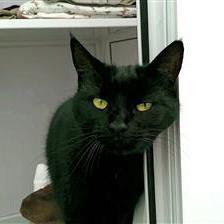 Sooty is a friendly and affectionate girl who also likes her independence. She is very chatty and always likes to greet you when you arrive home. Sooty likes a game with a toy ball, cotton reel or fishing rod toy. She enjoys exploring outside and then coming home to sleep somewhere warm and cozy. If you would like to meet this young lady check out her details on the Wood Green website. What sweet babies. Felix reminds me of my Natasha. :-) I hope they find homes soon. They are all cuties, I hope they get forever homes soon. Beautiful babies - we hope they find their forever homes soon. These guys are so cute. I hope they'll find their homes so soon!